Castlevania: The Dracula X Chronicles (悪魔城ドラキュラ Xクロニクル, Akumajou Dorakula X Curoniculu?, lit. Devil Castle Dracula X Chronicle) is a compilation of Castlevania games for the PlayStation Portable. The primary focus of this collection is a reskinned version of Castlevania: Rondo of Blood using new 3D models together with the original game code. This was the first time the game has been released outside Japan. 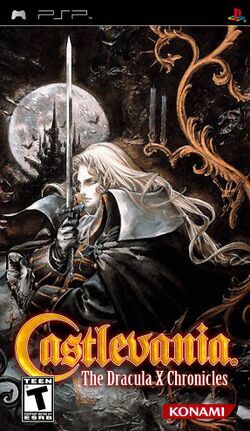 The original, unaltered game is also included, as well as its sequel Castlevania: Symphony of the Night. The unpopular "reduced port" Castlevania: Dracula X is absent, despite being part of the Dracula X sub-series. This page was last edited on 15 October 2018, at 08:27.